Prague, Sunday, day eight. The last day is here. The final 500 meter races and the closing ceremonies are occurring today. There is also a USA team celebration party scheduled for this evening back at the hotel. We have a lot to celebrate regardless of how today goes. It is hard to believe I’ve been here for an entire week and tomorrow I’ll be boarding a plane for home, but I still have today to enjoy and hopefully earn some more bling. The day started as usual: up, shower, breakfast, pack, board the bus and head to the race site in Racice. I’ve been writing this blog during the ride to and from the race site. It has helped pass the 45 minute ride each way and helped me get this accomplished during downtime rather than squeezing it in at the crack of dawn or late at night. It’s virtually impossible to write during the day at the event, it’s hectic and just too much is going on. It’s another beautiful Czech day. The sky is cloudless and the temperature is a little cooler, maybe in the mid 60’s, but I know it is going to warm up quickly and be a great day for racing. I don’t think there is a hint of wind either. The big item of controversy from yesterday revolved around the relative fairness between the different lanes on the race course. There seems to be a positive bias to the outside lanes, so much so that the officials have changed the top seeding lanes from lane three and four to lanes one and six. So, today, the lane assignments for the fastest qualifying teams will be different than for all of the preceding days. We’ll see how that works out. Our coach has been adamant and outspoken for several days that the bias exists and many other teams have agreed. It’s especially important to us because the USA is the defending world champion in the men’s open 500 meter event which is absolutely the crown jewel in dragon boat racing. So, fair and appropriate assignments are going to be critical. That accomplished, now we have to produce. The bus just spontaneously broke out in a round of the Star Spangled Banner, followed by a round of applause. We really want to sing that today in an awards ceremony. We’ve heard a little too much of the Canadian National anthem for our taste. We’re about at the race site now, so it’s “game on”. We’ll see how it goes. The day started out normally enough with all of the teams arriving and settling in to their tents. Those teams with early heats started warming up to get ready for racing. I wasn’t really prepared for the intensity of what happened next. Within a few minutes the walkways and tent doorways were filled with competitors ready to trade race clothes with each other. It was the first time there was significant intermingling of the paddlers from every country. I came away with a Macau, China race jersey, a Philippine long sleeve jersey and a Polish jersey. I am pretty happy with those trades. This activity went on all day long with great intensity. Maybe this should be incorporated into the official activities sponsored by the event coordinators! Approximately 6:00 pm: The Games have just been officially closed. Wow, what a day. It was another day for the ladies to shine and the youth team to receive their Gold medal from the 200 meter mixed that was held on Friday. While all the men’s teams made the medal rounds none could pull out a medal performance. The grand masters and the senior men’s teams each took fourth place, just hundredths of seconds behind the bronze position. The premier men could not defend their world championship title. The Chinese team put on an incredible clinic in the final beating the entire field soundly and the American team by almost eight seconds! They held a compact and efficient stroke down the entire course at a rate somewhere around 115 strokes per minute. Now, for the good news, all three of the women’s teams cranked out consistent heats and in the end each one of them all took home bronze medals. The games have been very competitive and energizing. It’s amazing how good some of these athletes and teams are. I have been privileged to be able to compete with these countries and their athletes. I have paddled with the best paddlers in the United States and made new friends with them. I have never paddled so hard for so long over so many days. It’s been exhilarating and exhausting at the same time. This is a week in my life that I will never forget, and I thank everyone that supported me so much in order for it to happen. We have our team celebration tonight and tomorrow I get to head back home. It’s back to reality, but I’ve missed everyone in my family and everyone back in Tampa, so now I can’t get home fast enough! 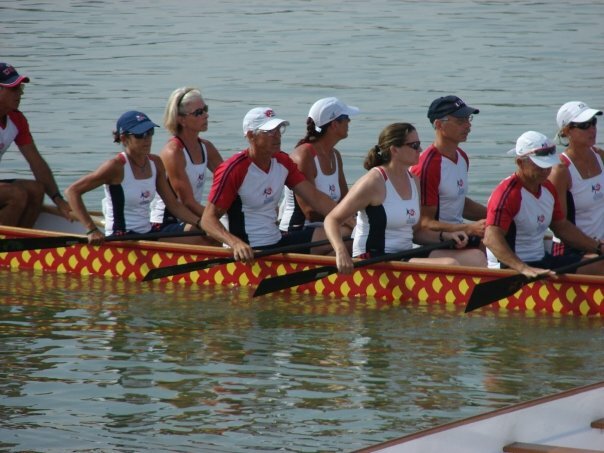 I also can’t wait until 2011 when Tampa will host the best World Dragon Boat Championships the world has ever seen!